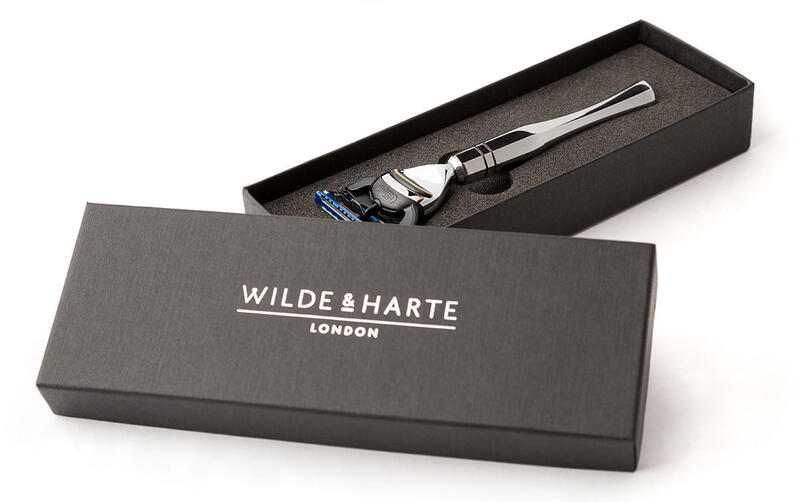 Reinvigorate your shaving routine with a hand crafted stainless steel razor and badger hair shaving brush from Wilde & Harte. Each item is designed, manufactured and hand polished in Britain. Each razor features monogrammed detailing and each shaving brush handle is engraved. Beautifully crafted optimum weighted shaving accessories to improve the wet shave experience. The 'Eltham' Fusion razor in handmade gift box. Inspired by Art Deco influenced Eltham Palace, Greenwich, London. We proudly introduce our luxury Collections of razors and shaving brushes, each inspired by the architecture, styles and the splendour of iconic London houses and palaces. This understated, minimal influenced contemporary Collection is named after Osterley House - the pinnacle of a spectacular Georgian Estate in rural West London.